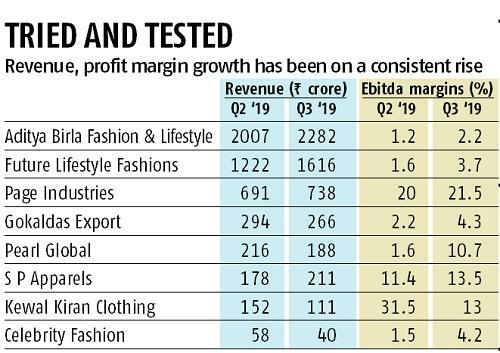 Branded apparel makers reported a steady increase in their profit margins in the December quarter on the back of increased sales in the festive season. 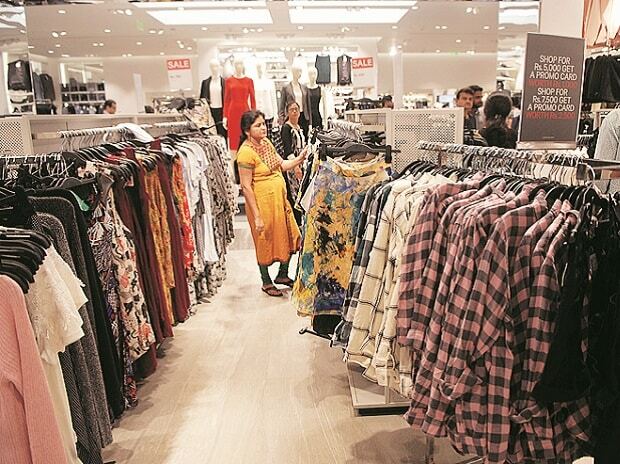 Data compiled by the global consultancy, Wazir Advisors, showed that Aditya Birla Fashion & Lifestyle reported a 2.2 per cent jump in earnings before interest, taxes, depreciation and amortization (EBITDA) margins for the quarter ended December 2018 as against 1.2 per cent posted in the previous quarter. The company had posted negative EBIDTA margins of 1.2 per cent for the quarter ended June 2018. Similarly, Gokaldas Export and Page Industries reported 4.3 per cent and 21.5 per cent of EBITDA margins for the quarter ended December 2018 versus 2.2 per cent and 20 per cent in the September quarter of 2018. “December quarter is always good due to festivals. There are a number of festivals including the Dussera, the Diwali and the Christmas and the New Year come during December quarter. Also, many wholesalers build their stocks during the December quarter which improves sales. Most importantly, no discounts are offered during the December quarter as it is the peak seasonal demand season. Hence, branded players report an increase in sales,” said Rahul Mehta, President, Clothing Manufacturers Association of India (CMAI). There are generally three major channels through which branded apparel is sold in the country - well-established distribution networks, company owned or franchisee stores and large format stores. Online selling or e-commerce is a very recent phenomenon. Both domestic and international brands have a presence across all the channels. “We will not do the business for less than 20 per cent of EBITDA margin. We currently have a high return on capital employed (ROCE) of more than 60 per cent which is highest in the industry while our peer groups don't have more than 15 – 16 per cent. Having said that we would like to grow much faster than the compounded annual growth rate (CAGR) growth we had delivered in the last 10 years, that was at 13 per cent. We are aiming for better growth than the rate at which we have grown in the last three years,” said Kewal Chand Jain, chairman and managing director, Kewal Kiran Clothing Ltd, which produces leading denim brands like Killer, Lawman pg3, Integriti, K-Lounge and Additions. The discounting of branded apparel has become a very common phenomenon after e-commerce players started offering discounts throughout the year. However, consumers have realized the real value of denim and have started buying from exclusive branded stores. Since large format stores don't want to take the risk of keeping an inventory, the choice available at such stores is limited and sometimes consumers may not get what they want. Exclusive brand outlets (EBOs), on the other hand, are always well stocked and offer a wider choice when compared to e-commerce and large format stores. Some of the foreign brands in the country have grown very fast at the expense of profitability whereas the leading domestic brand Killer believed in sustainability before scalability. Kewal Kiran Clothing has outlined a plan to invest Rs 150 crore in the next two years in expanding its capacities, in both denims and branded shirts and T-shirts. The company has also outlined a growth plan for its retail stores which currently number 336. The company plans to open 36 - 40 stores every year and also double the number of distributors.